None of us feel our absolute best during our period. Between unbearable cramps and frequent fatigue, we all face PMS symptoms that make us feel sick during our period. However, many women experience mild to moderate cold and flu-like symptoms before their period begins. Women that do experience these symptoms feel sick in a very different way. The American Congress of Obstetricians and Gynecologists have stated that many women get headaches, sore throat, muscles aches, and a runny nose before their period begins. Many women experience extreme fatigue, nausea, and even vomiting in some cases. Although PMS comes with many different symptoms, these symptoms reflect a viral illness such as a cold or a flu strain. Many women are curious to know why they typically feel ill before their period, but science has very few explanations for it. Unfortunately, there has been very little research done on this subject. A lot of research that has been done suggests that your period and the process of PMS can take a toll on your immune system and it can’t fight illness the way it usually does. Prostaglandin hormones could also be a major contributor. These fatty acid compounds affect a woman’s body similar to how many other hormones do. When these are released right before your period, they can affect your body in a negative way, causing cold and flu-like symptoms. Some doctors don’t believe that women experience flu or cold-like symptoms before their period and that their symptoms have another explanation. 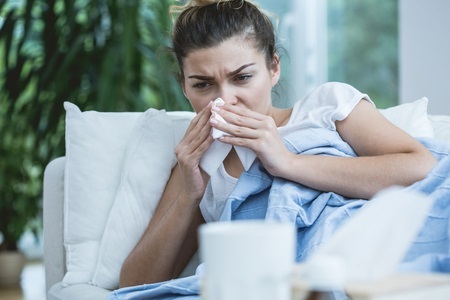 Dr. Steven R. Goldstein, an OBGYN professor at New York University School of Medicine, said that women are really experiencing allergy symptoms that are exaggerated due to hormone shifts. In reality, there is too little research to prove the theory one way or the other. If you experience cold or flu-like symptoms before your period, do what you can to fight off the illness. Make sure you eat healthy and that your diet is rich with produce, whole grains, and proteins. You should also be drinking a lot of water and getting as much rest as possible. Consider using natural relief when those PMS symptoms do begin, such as Comforté.